Sony has unleashed its latest mirrorless full-frame camera dubbed A7 II. It brings an improved body, speedier focusing, new video capture abilities and is the first full-frame mirrorless camera to have in-body stabilization. The A7 II relies on a 5-axis IS that will move the sensor (sensor shift technology) to avoid blurring. Sony claims the new IS could compensate up to 4.5 stops (CIPA standard). The new built-in IS will work with any lens attached and is particularly useful when using non-Sony lenses by means of an adapter. If you’re using an E-Mount Sony lens with built-in OSS the camera will detect it and combine it with its built-in IS for an even steadier shots. The Sony A7 II retains the 24MP of its predecessor but adds a couple of improvements. The grip of the camera is now bigger and accommodates a more comfortably-placed shutter button and a new dial on the front. The front panel is now made out of magnesium alloy. Sony claims the focus is improved in speed by 30% and is now 1.5x better at tracking all the while the 117 phase detect and 25 contrast detect points remain intact. The Sony A7 II doesn’t include the 4K video shooting option of the A7s but incorporates the XAVC S codec with its 1080p@60fps mode so that you can get 50Mbps bitrate. The S-Log2 mode has made its way to the A7 II as well for a wider dynamic range during recording. Sony will release its A7 II in Japan first. It’s expected to land there on December 5 for JPY190,000 (round €1,280 or $1,600). The A7 II comes a year after Sony released the first full-frame mirrorless cameras in the 24MP A7 and 36.4MP A7r. 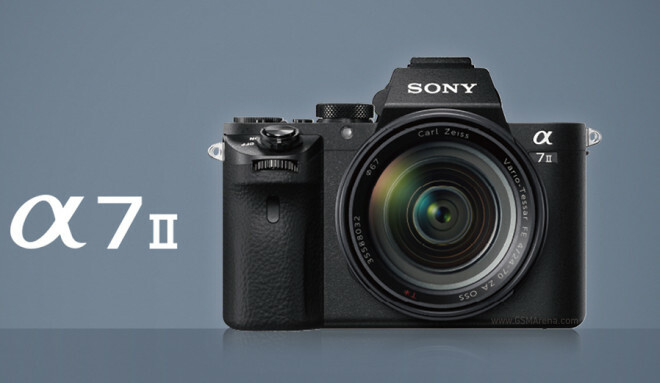 It released the 12MP low-light beast A7s recently so landscape fans are now eagerly awaiting an A7r II.